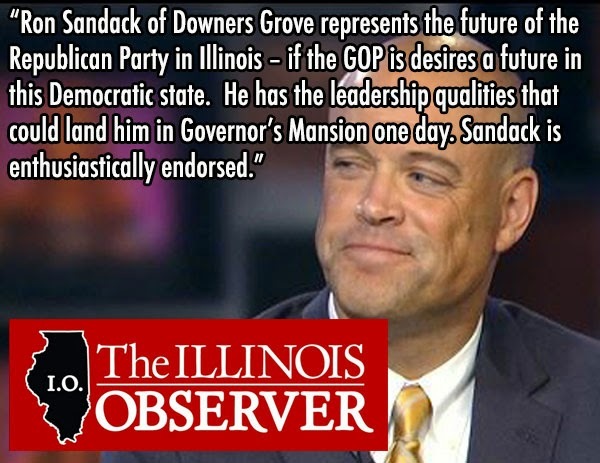 State Rep. Ron Sandack of Downers Grove represents the future of the Republican Party in Illinois – if the GOP is desires a future in this Democratic state. A former mayor of Downers Grove and an attorney, Sandack has mastered the art of compromise in the legislature and has moored his ideology in competent conservatism. He has repeatedly backed and robustly defended painful pension changes even amid harsh opposition. ...He has the leadership qualities that could land him in Governor’s Mansion one day. Sandack is enthusiastically endorsed. Go read the whole thing at the Illinois Observer.